The Department fulfils a vital role within the broader Information Technology spectrum in South Africa, as well as internationally. Our main objective is to explore and research the scientific basis of new technologies. We furthermore promote the proliferation of reliable, robust and innovative computing and information technologies into the IT-industry in South Africa. Excellence in computer science education, the development of internationally and nationally recognized research initiatives and strong industry collaboration are the driving factors underpinning the success of the Department of Computer Science. 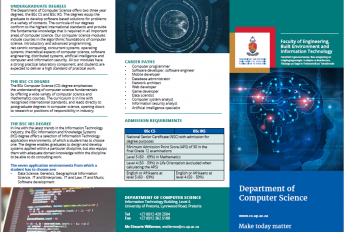 The University of Pretoria is unique in administering Information Science, Informatics (Information Systems) and Computer Science from within a single School of Information Technology (SIT). The Computer Science Department offers two three-year degrees, the BSc (CS) and BSc IT. The degrees equip the graduate to develop software-based solutions for problems in a variety of contexts. 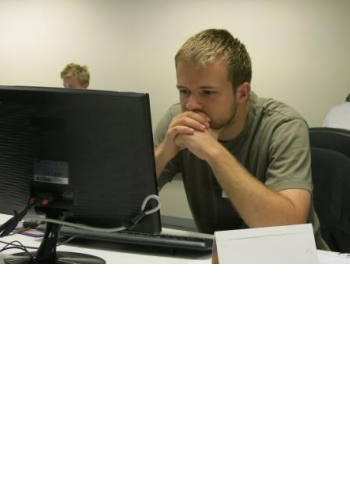 The Department of Computer Science offers research-based MSc and PhD degrees, and now also a Masters in IT (MIT) degree by coursework and dissertation.